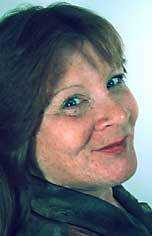 Marianne Donnelly, multidisciplinary performing artist provides quality family entertainment with strong educational content in a creative dramatic style. Shows and workshops are developed for schools, libraries, fairs, festivals, promotionals, bookstores, conventions and private functions. Themes include humor, history, nature, respect, sharing and caring. Songs, stories, movement, magic, games participation and select cultural touchstones are woven into rich theatrical experiences that delight ages three through adult. Exquisite costumes enhance the vibrant, joyful performances. "A joyful riot" according to the Boston Globe. "Janis Joplin: Talkin 'bout The 60's" is an accurate account of the social movements of the 60's through a first person portayal of Janis. The events of her life and times are woven together in a dynamic, informative performance. 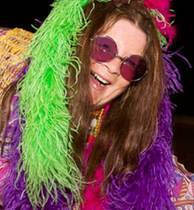 Ms. Donnelly's vocal style emulates the great Queen of Rock & Roll and has performed Janis at the Cambridge River Festivals (Mass. ),in NYC at a Greenwich Village cafe, Killington Motorcycle Rally (VT) and private events. Appropriate for ages 16 and up. Two versions are available: one for schools and history programs and one for clubs and older audiences. With songs, games and stories of abundance drawn from Celtic, Native American and German harvest folklore, Pumpkinette brings to life harvest festivals, school events, libraries shows and corporate functions. Naure appreciation, Halloween and sharing stories available. The Boston Globe says, "a joyful entertainer." With whoops, hoops, laughter and history, her myth is dispelled and story told. The westward movement migration diaries and railroad lore quotes make this an especially appealing educational show for schools, libraries and special functions. The Arizona Republic says, "Ms. Donnelly's acting skills are well crafted." View video excerpt of Marianne Donnelly in performance as Louisa May Alcott. Louisa May is a carefully researched portrayal of writer, suffragist and abolitionist Louisa May Alcott best remembered for her classic childrens books. She is accurately and passsionately brought to life for grades four through adult. A Learning guide is available for schools and libraries. Boston, MA Public Library president Bernie Margolis has praised her performance at their 150th anniversary celebration.